Senator Abaribe asks court to discharge him as Nnamdi Kanu’s surety – Royal Times of Nigeria. Senator Enyinaya Abaribe (Abia South) has applied to the court to be discharged from the suretyship, bond and recognisance of the bail of the leader of the Indigenous People of Biafra (IPOB), Nnamdi Kanu. It could be recalled that Abaribe had helped secure Kanu’s bail earlier this year, alongside a Jewish Rabbi and traditional ruler. 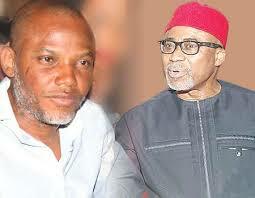 In an application filed against the Federal Government (first respondent), Kanu (second respondent), and his co-defendants, Senator Abaribe is asking to discharge him entirely from the incidence of bail of Kanu. He is also asking for a discharge of the bond used for Kanu’s bail and a refund of N100 million or any other bond paid to the court sequel to the bail. As at the filing of this report the application though before justice Binta Nyako is yet to be heard.